. . . the development of singular they mirrors the development of the singular you from the plural you, yet we don't complain that singular you is ungrammatical . . . . The use of singular they builds on centuries of usage, appearing in the work of writers such as Chaucer, Shakespeare, and Jane Austen. In 2015, singular they was embraced by the Washington Post style guide. Bill Walsh, copy editor for the Post, described it as "the only sensible solution to English's lack of a gender-neutral third-person singular personal pronoun." While editors have increasingly moved to accepting singular they when used in a generic fashion, voters in the Word of the Year proceedings singled out its newer usage as an identifier for someone who may identify as "non-binary" in gender terms. "In the past year, new expressions of gender identity have generated a deal of discussion, and singular they has become a particularly significant element of that conversation," Zimmer said. "While many novel gender-neutral pronouns have been proposed, they has the advantage of already being part of the language." Cameron (1995) makes the persuasive point that the difference between description and prescription may not be as great as linguists think: after all, a description by its nature encourages a sense of what is 'normal' within a system. More importantly, she suggests that it is a good idea for linguistics to listen to what people interested in language have to say about it, primarily so that we can understand why they hold views which, from an insiders' viewpoint, appear ill-conceived or even meaningless. The Relative agrees with the Antecedent in gender, number, and person. . . The Relative shall agree in gender with the Antecedent of the more worthy gender: as, the King and the Queen whom I honor. The Masculine gender is more worthy than the Feminine. Thus, the 1850 Act of Parliament and Kirby's Rules 21-2 manifest their underlying androcentric values and world-view in two ways. 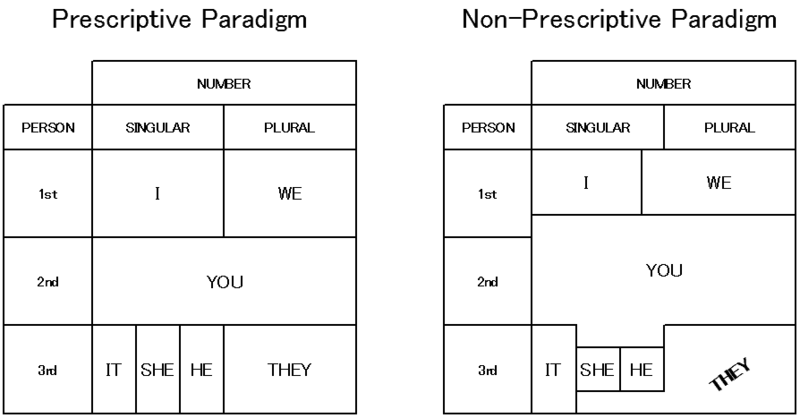 First, linguistically analogous phenomena (number and gender) are handled very differently (singular or plural as generic vs. masculine only as generic). Second, the precept just being established is itself violated in not allowing singular 'they', since if the plural 'shall be deemed and taken' to include the singular, then surely 'they' includes 'she' and 'he' and 'she or he'.
. . . despite almost two centuries of vigorous attempts to analyze and regulate it out of existence, singular 'they' is alive and well. Its survival is all the more remarkable considering that the weight of virtually the entire educational and publishing establishment has been behind the attempt to eradicate it. ・ Let each esteem others better than themselves.---Philippians, ii. 3. ・ Each was swayed by the emotion within them, much as the candle-flame was swayed by the tempest without.---Hardy. ・ Nobody knows what it is to lose a friend till they have lost him.---Fielding. ・ Everyone must judge of their feelings.---Byron. ・ No one in their senses could doubt.---Dickens. ・ Nobody will come in, will they?---Priestley. ・ The feelings of the parent upon committing the cherished object of their cares and affections to the stormy sea of life.---S. Ferrier. ・ If an ox gore a man or a woman, that they die; then the ox shall be surely stoned.---Exodus, xxi. 28.